Ryne reached his hand up to scratch his cheek, then caught himself and resisted. He hadn’t had time to shave before heading out that morning on the seven-hour drive up to the man’s estate. He glanced around the display room. The man he was meeting was a private collector of artifacts. And Ryne was waiting in what appeared to be a preparation room of sorts. The man had the skeletal head of some dinosaur lying on the ground on a plastic sheet. On the same sheet were some tools like brushes and something that looked like the tool dentists use to scrape tartar off teeth. On a nearby wooden work bench was one of the original prop ray guns used in that popular 70’s science fiction adventure show that Ryne used to watch with his grandfather when he was a kid. He wondered what his grandfather would make of the place. Gramps never did approve of private collectors. As a young man, Ryne’s grandfather had come across some rare artifacts while on holiday. He could have legally kept them and sold them, but he chose to donate them to a local museum. He had instilled in Ryne a love of museums and old artifacts, a respect for the past and those who came before. Ryne ignored the items in the work room. He had come for a rarer treasure. A myth come to life. That was his specialty. It was his passion. It was his life’s work. And in this particular case, he had another reason for wanting the artifact he sought. For he had a promise to keep. He’d been seeking the artifact for almost five years. The Shield of the Rainheralds. As he waited nervously, Ryne recalled the three-thousand-year-old legend that set him on the quest for the shield. It started off with innocent enough intent. A magician in the northern lands sought to save his people from one of the worst and longest lasting droughts in the land’s history. After many perilous and failed attempts, he discovered how to capture and harness a raincloud. He was able to pull the raincloud from over the borders of his own lands and onto a farm growing wheat and corn. The magician thought that the raincloud would eventually dissipate and vanish, but so long as he held it in his enchantment, it continued to do what a raincloud does. It rained. The magician began to pull the raincloud to every duchy and village and farm in the northern lands. He even hired a troubadour to herald his arrival. One troubadour became a troop of five. Joining the troubadour were a couple of dancers, a harper, and even a historian. The troop moved ahead of the magician always, to sing of his coming so that farmers could plant and prepare. The magician was praised throughout the north. News of his accomplishment spread through the song and dance and poetry of the troop that came to be known as the Rainheralds. In time, other magicians from the surrounding lands learned the enchantment for capturing rainclouds by sending their spies into the northern lands. They began to change the harnessing spell so that they could capture other kinds of clouds as well: big fluffy nimbus clouds and long, streaky cirrus clouds and grey and white clouds that piled into blankets, only darkening the sky but never releasing rain. And clouds, which once were free and natural, became like the precious stones of the earth, rare treasures held by the rulers of the different lands and passed down like jewelry and titles. The clouds were used not just to water crops and the like, but in war, for some captured clouds were storm clouds, monstrous and unrelenting. Some were used to blanket enemy territories and starve them of sunlight, so even if their crops received plenty of rain, they would wither and die. Thereafter, the Rainheralds of the north came not with song and dance, but with warning. For clouds no longer meant rain and refreshment, shade and beauty. Clouds meant war and strife. After some years of warring and storming and fog and famine, there came a day when the army of the northern lands met the forces of the western lands on a field of battle. It was raining heavily. There were clouds in the sky. Always, there were clouds in the sky. But on that day, something strange began to happen as the armies marched toward each other. The dark gray skies came alight. All looked up and saw waves and ribbons of light colored with the warm hues of sunset and the cool shades of twilight. Suddenly the colors flashed. Bolts of lightning struck the ground and reached through the soldiers of the north to the high hills where the northern army kept their camps. Some witnessed what happened next. The bolts of the lightning seem to be seeking and when they found what they sought, they struck. They struck the five heralds of rain. And turned them into ravens. Up flew the ravens, cawing and flapping, above the high hills. All five flew west toward the two armies. The sovereign of the northern lands and the magician who caught the first raincloud rode at the head of the northern army. They bore, like every soldier of every army in that rain-soaked realm, shields enchanted to divert rain and withstand lightning. The shields of the northern army bore the image of clouds dropping lightning. They did not see the ravens flying above at first. Not until the magician heard their cries and lowered his rain shield. An ill omen it seemed, five ravens circling above their army as if waiting to carry the dead to the afterworld. But when one of the ravens flew closer, the magician let it land on his shield. His sovereign rode up to him. And to their shock, the raven spoke. On marched the army. Through the squelching of mud, the drumming of rain on shields, and the distant thunder of the enemy’s storm clouds, it was difficult to hear speech. The magician and the sovereign looked at each other, as if silently questioning each other on whether or not they had heard what they thought they had heard. “What are you, creature, that you should command my magician?” the sovereign demanded. “We are the heralds of rain,” the raven said. The magician looked at the raven and at the four who still flew and circled above. Five ravens. 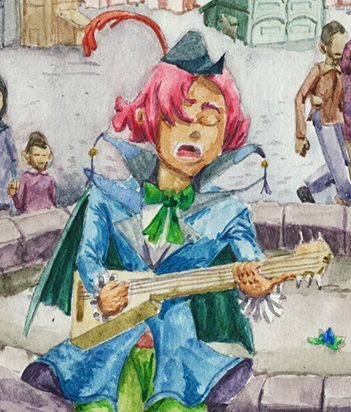 And he guessed the one who perched upon his shield was the first, their leader, the troubadour who had first sung of the magician and his raincloud. The sovereign eyed the raven with suspicion. But the magician was still curious. “And what of these spirits of nature?” the magician asked. “It seems to me that if we release the clouds, they will be angry at being harnessed, and will want to punish us,” the sovereign said. “Then we must assure we never release them,” the sovereign said. “Away with you.” He used his rain shield to bat the bird away. The raven cawed in anger and flapped up to join the others. The magician watched and wondered. He had for a while wondered what harm was being done by all the captured clouds to his land, to other lands, to the sky, to the people, and to the other creatures who lived in the realm. As the armies clashed, the magician did his duty. He unleashed their army’s storm clouds to batter their enemies. And when the day’s battle was done, with much struggling, he recovered the clouds again. That night, as a cold fog settled through both army’s camps, all the better to deter spies, the magician was visited once again. But he had been waiting for them. He had left a space open in the roof of his tent and down flew the five ravens. They were no longer his heralds. They belonged to the clouds now. Harnessed though they were, the clouds had powers the magician did not know of. “Release the clouds,” the raven, the Rainherald, said again. The Rainherald gave a bow and flew out. The others followed. The magician watched them go and though he feared the retribution of the clouds, he also knew that if he could do the thing, he must release them. Already there were floods and quakes and disasters in his land that had nothing to do with war. And all to do, he feared, with the captured clouds. The next time the northern army went into battle, the Rainheralds, the ravens, flew into the enemy army’s camps, observing their clouds and reporting back what they saw. The magician believed he could try undoing the harnesses on the enemy’s clouds. The northern army stood at the ready, defending with lightning proofed shields and well-oiled uniforms to resist the rain. The magician raised his hands and moved them in the patterns of undoing according to what that the Rainheralds described. For by some magic, the ravens could indeed see the harnesses, though they could not themselves undo them. The magician worked and when he finished he frowned, for he could not see if his efforts had truly freed the enemy’s clouds. The rainclouds rained and stormed as the armies fought, but instead of being pulled back when the enemy was routed, the clouds dissipated, much to the enemy army’s surprise and dismay. They were left without a single cloud to recover. The northern sovereign and the northern army too were surprised, for the magician had told no one what he had planned. But the sovereign was pleased and he let the magician try the tactic with other armies and it almost always worked. The magician wasn’t able to figure out every harness. But the more clouds he freed, the more he learned, and the more the Rainheralds learned of how to see and describe the harnesses better. Word of the Rainheralds spread and enemy armies began to start firing arrows at the ravens when they saw the birds circling. Magicians tried to command their storm clouds to throw lightning on the birds, but they could not. Storm clouds were unruly even when harnessed. They could be unleashed but not controlled. Other magicians turned scouts and soldiers into ravens and gave them speech and sent them up into the sky to see what the Rainheralds saw, but it didn’t work. The Rainheralds had been transformed by the clouds themselves, or some other force beyond the clouds. It was a mystery, even to the heralds. Soon enough, the northern lands were the only land with harnessed clouds. The magicians of other lands try to harness more storm clouds, but they could not. For no clouds would dare appear on their lands, which soon began to grow thirsty. The Rainheralds demanded that the northern lands release their clouds as well. And they warned that the clouds would likely not return out of anger for their imprisonment and fear that it could happen again. The northern lands would thirst like all the others, unless they, the Rainheralds, could convince the clouds to return. They were chosen by the clouds, chosen to be the clouds’ heralds. But they had once been the heralds of men and would try to entreat the clouds on behalf of the peoples of all the lands. So it was that the magician released the clouds he had captured. And the Rainheralds flew away to entreat the clouds and returned with word that the clouds would meet with the leaders of the realm. The leaders of the lands to the north, south, east, and west met on neutral ground and received the word of the Rainheralds. The magicians too were present. All met out in the clear sky and soon saw a gathering of white clouds approach, blown by a fair wind. Immediately, one of the magicians attempted to harness one of the clouds. The Rainheralds cried out. And the others tried to stop the magician. And the harnessing failed, for the clouds had learned how to foil it. But the white clouds grayed and flattened. They darkened and grew. And though the leaders pleaded and declared they would punish the magician, the clouds seemed not to heed their words. Lightning flashed above. Some of the other magicians, believing that all was lost, tried the only thing they could try, though it was folly. They too now tried to harness the clouds, but they failed. They could not do it. Seeing them fail made others try. Only one magician refrained. The magician of the north. He called out to the Rainheralds. He knew they were the only hope. But the clouds were too angry. All present raised up their rain shields. But with a flash, bolts of lightning struck the shields of the magicians, shattering them. And another bolt struck the magicians, killing them. The soldiers and leaders were unharmed, but they fled and returned to their homes and lamented the folly of magicians. In the northern kingdom, the people feared they would die from drought and began to prepare plans. But they also feared that the clouds would come and destroy them. Sure enough one morning, the Rainheralds came crying. The sky was clear, but a blanket of clouds moved in and forestalled the dawn. And it began to rain. And it rained and it rained. It rained every day. And soon, it rained for the greater part of every day. And soon, it rained all the time. So flooded had the land become, that the people began to build raised platforms, then rooms, then homes in the trees. The sovereign and his advisors wondered if they could divert the rain as a river could be diverted. Only, diverting the rains could not be managed by industrious workers and clever construction. The northern magician, despite starting the calamity, had been the only magician spared. The sovereign banished him. But he sought to atone for his folly and the folly of the other magicians. He approached the sovereign of the north and declared that he would travel away and up to the realm where the clouds lived in the hopes of finding whatever force or being ruled the clouds and begging that the realm be spared by surrendering himself. He would take the help and guidance of the Rainheralds. The journey would take a few generations. The northern sovereign, remembering how well the magician had served and how true he had been before the era of captured clouds, agreed and gave the magician what supplies and help he could. The sovereign planned to move his people, but the Rainheralds warned him that there was no land within easy distance that wasn’t covered in rain. The Rainheralds told the sovereign that by the time the magician returned, if ever he did, the northern land would become a jungle. The magician had one last trick that he presented to the sovereign to try and save their people. And the sovereign agreed. Spending all his reserves of energy and skill, the magician turned all but a chosen few people of the northern lands into monkeys. The monkeys could live among the trees, easily swinging up into the highest branches, safe from the rushing floods below. They might still die, but they could withstand the never-ending rain better than they could as people. He gave the sovereign the secret of the spell written on a parchment, so that if he didn’t return, someone could undo what he had done. Though there were no magicians left, a clever scholar (or more likely a group of clever scholars) might be able to make the undoing spell work. The sovereign himself took a small, brave group of explorers to strike out into the world and find a safe and dry place for their people. The magician gave them potions that would turn them into monkeys as well should their quest fail and they need wait on him. The sovereign and his band took up their rain shields and left. The magician never returned. His fate remained unknown. Some said he succeeded in reaching the cloud realm and convincing the clouds to show mercy. For in a few generations’ time, the perpetual rains of the northern lands stopped. And thereafter the rainclouds would come and go. The rain would come and go. It was not a chill rain mostly but a warm rain. The land had grown humid and lush. The monkeys remembered they had once been men and women, but they had adapted to the rain, and once it stopped, they thrived. As for the sovereign and his party, they did find a land untroubled by the vengeance of clouds. But their travels had led them so far and through so many travails that they longed for rest. That rest became permanent as the sovereign of the north saw how well the remnants of his people took to the new land. But he knew he had to return for the rest of his people. So one day he did. He was never seen again and was believed to be lost at sea. He had left his shield behind, for on it was scribed the magician’s undoing spell. The sovereign had scribed it himself in case the magician’s parchment was lost. So too had he reworked the painting on the shield’s face to remind himself of the story of his land, of his people turned to ravens and monkeys, of the unending rain, of his quest’s purpose, his duty. The parchment was eventually lost. But the shield, the shield remained. And that is what Ryne sought. When the man finally brought the shield out, Ryne set it down and gazed at it. The shield was embossed with the image of five ravens in flight under a storm cloud. The Shield of the Rainheralds. Under the embossed metal, there would be the original painting done by the sovereign of the north. The five ravens under storm clouds and below them, a monkey perched on a branch, looking out expectantly. Whoever placed the fancy new cover on the shield likely didn’t think the monkey looked heroic enough. It did not matter. What mattered was the spell inscribed on the inside of the shield. An undoing spell. So the legends said, but Ryne would see for himself. Magicians were tricky. Myths were changeable. And there had to be some reason the shield was named for the Rainheralds and not the sovereign who had owned it. Ryne had attempted to purchase the shield, but the private collector had refused. And he refused to donate it to the museum that Ryne worked for. But he had agreed to let Ryne take a few pictures for research. As Ryne clicked away, the shield’s owner hovering over his shoulder, he heard the man groan. That would be the nausea and the vertigo. The man had been careful. But he did not suspect that the chemical trap into which Ryne led him was on Ryne’s bare hands. Ryne had touched everyone he had passed on his way in. The reaction was a form of allergy that he himself was immune to, mostly. Ryne glanced at the man’s collection as he stalked out of the house past sleeping guards and servants, but he stopped himself. The shield was his only purpose in that place. And he had to be long gone before someone sounded the alarm. He had made a promise to the king of the monkeys. He intended to keep it.